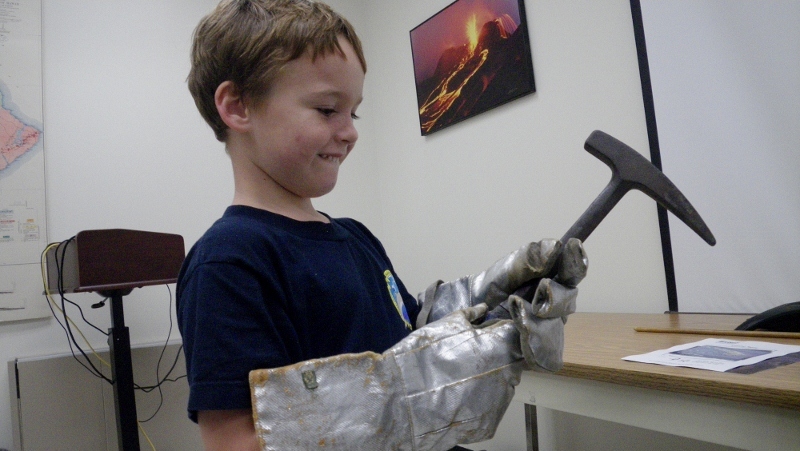 Big Island trip – we got to meet a real volcanologist! The family, including Gramma and Richard, went to the Big Island for Sam's birthday. Really, his 6th was a great reason to take Ben for the first time, and revisit the experience we had with Sam when he turned 2. That was four years ago already, hard to believe. Visiting the volcano island is always a special experience. The volcano cake was a big hit - I am thankful for all the teamwork which made Sam's day special! 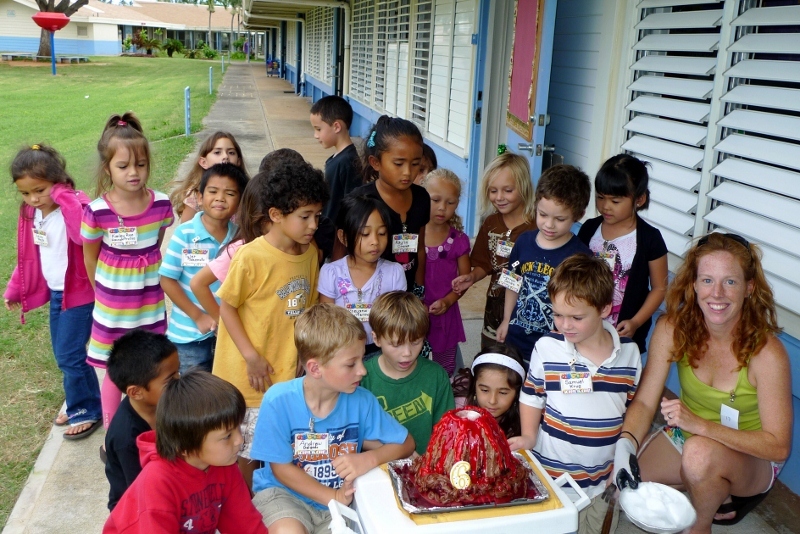 And a special MAHALO to Mrs. Muraoka for allowing us to share this cake with the kids. 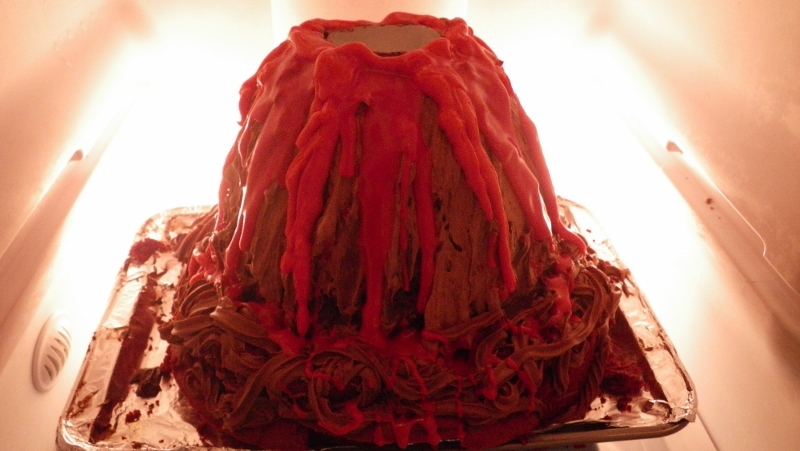 We had a great time taking a volcano cake to school – a great culmination to three days of planning and effort. Here is the entire video mom shot of science class 🙂 Click on the picture for more photos from the day. And don’t miss checking out the Jan folder for all the assembly pictures. The cake is coming to life! Meet Kilauea, the most active volcano on earth! We take it into school tomorrow and make some smoke come out the top with dry ice! Up by Kalama Beach Park there is a LOT of driftwood right now. People have built forts with it, and as we passed this long bamboo pole I found myself just itching to get it home...somehow. 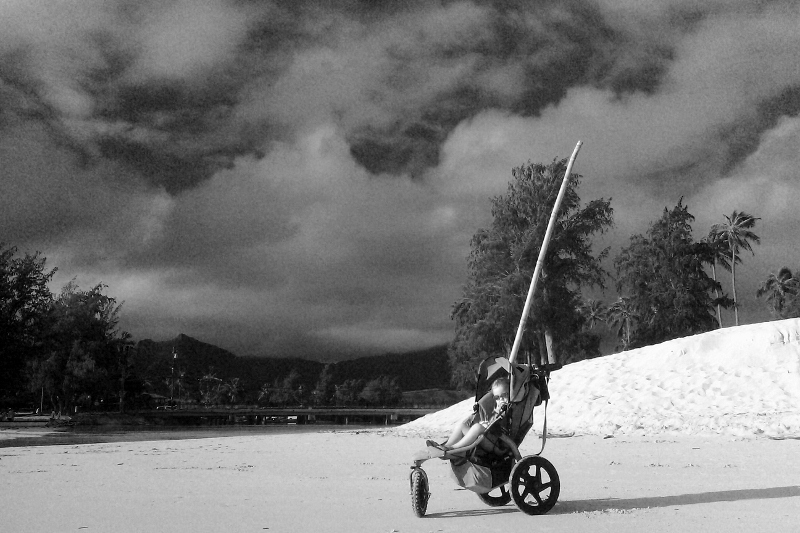 I rigged it up in the stroller with my bungee cord (always keep one handy on the "roof rack"). It's about 10 ft long I think. I got a lot of funny looks - more than usual - as we ran down the beach and then through town. But now I totally understand the pride a boy feels in finding and hauling such a trophy home. Fish faces at Sea Life Park! I feel like I’m somehow cheating on Sam if I take Ben out on an adventure while Sam is in school. I talked it over with Sam this morning and he said it would be ok provided I took him sometime later. So off we went, and I bought annual passes for us so we could head down after school sometime. Every time I go to SLP it is a great adventure. Today’s highlight was a scuba diver (woman) feeding the rays! She came up really close to the glass so we could see her hand feed shrimp into the ray’s gaping mouth. They were so gentle with her, giving kisses, coming to her when motioned to. It was so fascinating. Sam's birthday is in 10 days. His idea for a sunrise hike was an excellent one! We all had a great time. Thanks to the moms who helped make this memory! Click for more pictures of the outing. And here is a link to Sam’s bday invite. These tide pools emerge in the winter when the sand is relocated by the north swells. It's a tad chillier for swimming, but when you're jumping in and out, working hard, you hardly notice it in the warm afternoon sun. 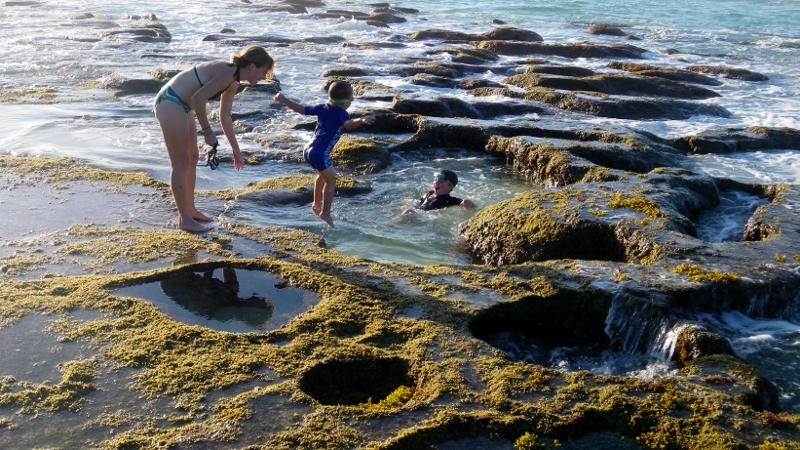 Dave took some really great shots of these tide pools. We really love this place and were happy to see the pools reemerge in the low tide. Sam and I are looking forward to our sunrise hike tomorrow morning with three buddies of Sam’s. We’ll be up early at 0530, and on top of a little pu’u (hill) by 6:30am ready for 7:11 sunrise. Mercury gets up at 5:42am, so maybe we’ll see that planet on our walk up. 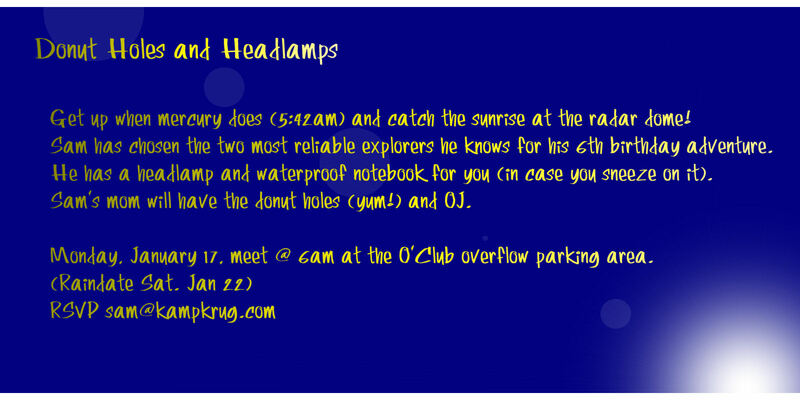 I have blinking headlamps for boys, glow sticks, coffee for moms and doughnut holes for the top 🙂 I also have whistles for the way down to wake the rest of the base up – ha ha! As I was getting my coffee carafe unpacked, I noticed it is a 34 oz carafe. So I asked Sam casually, “How many 8 oz cups of coffee will we have if this is a 34 oz carafe?” He paced a bit with his 25 ft rope in hand (he’s been working on knots and stuff with the rope, featured in a couple of the shots linked from the above picture). “Four and a quarter, Mom.” He had the answer in 16 seconds (I was still working on the second part of the answer as he said it!). Wow. He is one cool kid. But his latest report card says he’s DP (developing proficiency) using objects or fingers to add and subtract single digit whole numbers. A burden I carry around with me every day is unraveling this fundamental disconnect between who he is at home, and what the teacher says he is at school. Am I doing the right thing for Sam’s education? Should I be doing more? Is he getting enough stimulation and challenge outside the classroom to make up for what he’s not getting in class? Is observing the other kids in class and learning to work within a system, however unchallenging, a viable form of learning at this stage? It is only Kindergarten, after all, I tell myself most days. So while I grapple with this question, I continue to invest my time and energy in nurturing my kids as best I can outside the classroom and volunteer my time and energy to help refine programs, policies, strategies to help other kids reach their potential at school. Maybe one day I’ll be a science tutor to contribute more to the local education system. Foiled twice by a honu! A lifeguard found this guy on his back, on his tower ramp. Way up a steep embankment. We have no idea how he ended up there, but the lifeguard was able to carry him back down to the beach and he seemed just fine once he got in the water. How incredible! He was about 2 1/2 ft long from nose to tail. Gorgeous, healthy guy as far as I can tell. Ben and I were supposed to go to the Y again today – getting back into a Friday yoga routine for me. 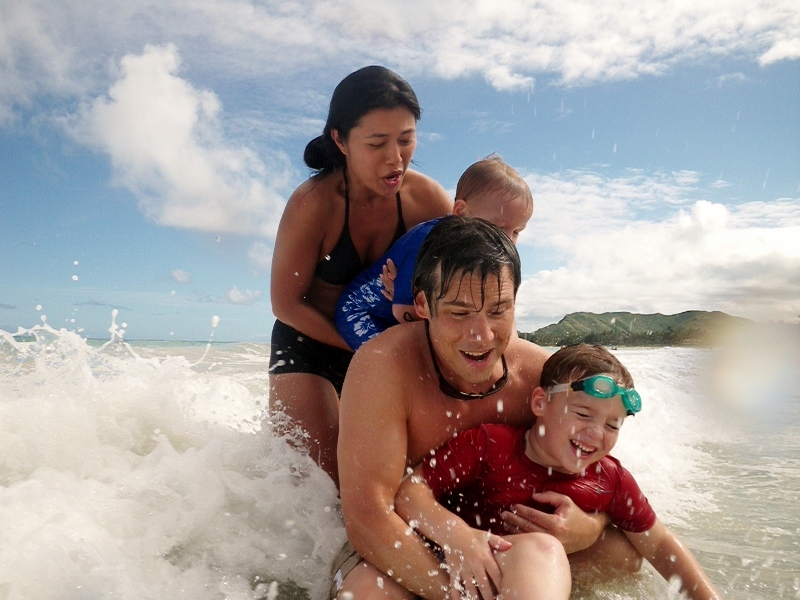 But last week we were foiled in our attempt by a honu (turtle) we spotted just offshore as we jogged down the beach, followed by watching two surfers. Today – Friday – we had plans to go to the Y again, but as we finished our jog we met a really neat lady walking a dog and got to chatting about Caffrey (the lady happens to be with Lab Rescue in PA – a group I’d contacted a year ago to find out about a rescue chapter here on O’ahu!). As we parted ways we noticed the lifeguard carrying a turtle down to the water! Wow! How exciting! But it was totally odd – he’d found the large turtle on its back and way up on his tower ramp, at least 10 ft up a very steep embankment the turtle could never have climbed. Was it put there by someone? Or did it truly get there somehow? In any case, the turtle seemed just fine once it hit water. But the lifeguard was totally perplexed. Almost in shock, saying over and over again it was the weirdest thing he’d ever seen. Me too! 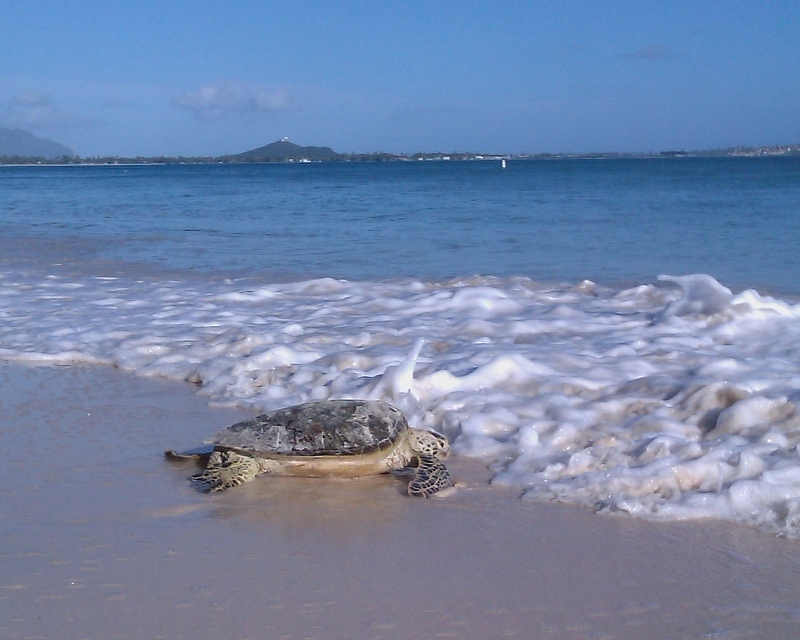 But I was glad to grab a picture of this rascally honu before he swam away. Thankful to miss the Y again today for chance meetings like this. No wonder I am addicted to jogging the beach with Ben in the early morning. It’s especially nice that mom and Richard are here now, so I can hook up with mom for coffee (and hard boiled eggs for Ben – his favorite! see Mom’s blog for pictures of him in pursuit of the perfect egg – http://clanskene.blogspot.com/2011/01/buying-hard-boiled-egg-at-2-12-years.html). Sam tackling his homework after school in the face of 50mph gusts. 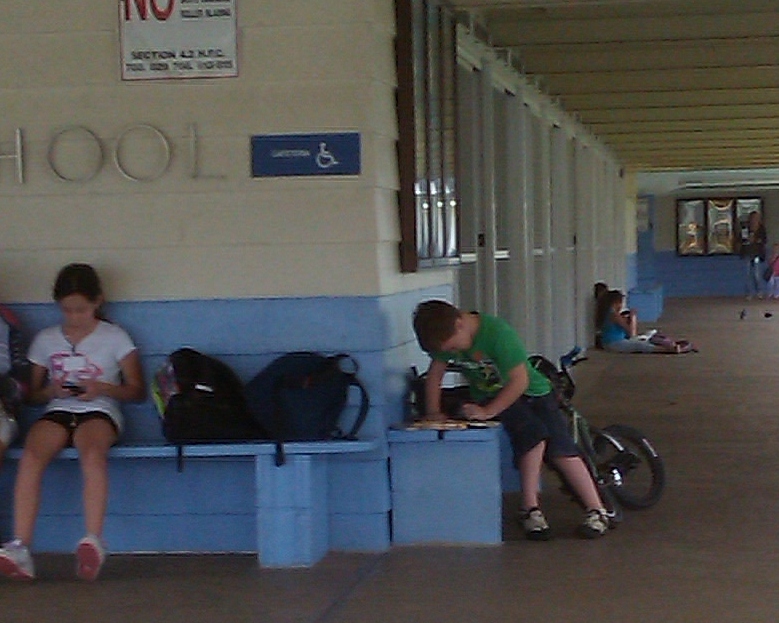 He is holding his papers down while he finishes up. He wants me to come about 15 min after school gets out so he can get it all done and be free and clear when he gets in the truck. 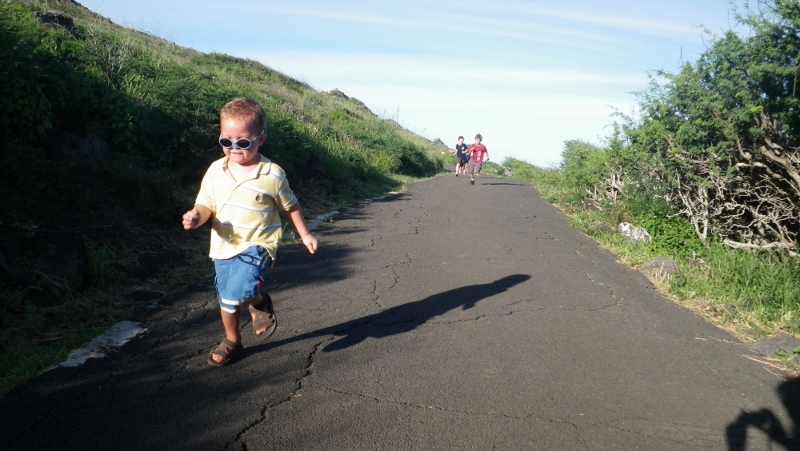 The kids ran about half the hike uphill, then almost all the way down hill! They were so funny, barreling downhill with people parting the way so they could plow through. Tamara and I were trying to keep up, then all of a sudden one of the little ones would sit right down in the middle of the small road and play with rocks in the crevices of the asphalt! No one got hurt, miraculously! Sam slept in an hour late this morning, so he got over 12 hours of sleep last night! Wow! So I got Ben fed and ready, printed out my tardy letter (which explains my policy is to not wake children before third grade because sleep is just as essential as proper nutrition and exercise to neural development) and waited for Sam to come out. He did, all dressed and rather smiley. It was worth the wait! So we grabbed a can of Ensure Plus, a banana and off we went to school on bike and foot. It is very relaxing to be late. There is no mad panic to save 42 seconds enroute. From school Ben and I decided to jog down the beach even though I had plans to finally return to the Y for yoga after a long hiatus. 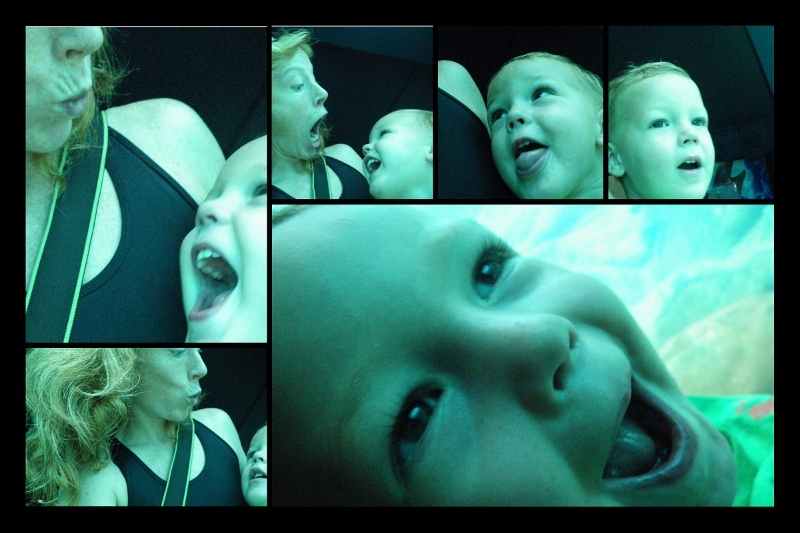 Well…our beach sojourn ended up being way too fun so I had to cancel the Y, but it was well worth it. This is one of the reasons I like being uncommitted most mornings. You just never know where the next surprise blessing will come from. Thanks to Dave working so hard, I can give the boys that freedom while they’re small to explore and roam, picking up friends and adventures wherever we go. It started out a good morning – we were greeted by a honu head popping out of the water as I took my running shoes off to jog down the beach with Ben. Then when we got halfway between Castles and Kalama we saw these two guys…They were reaaally working these tiny waves for all they were worth. Ben and I watched for a while and clapped. The guy shown surfing was all smiles when he came up and saw us watching. We gave a thumbs-up and clapped and he waved, then dove back in the water, then jumped up on his short board and rode it back out through a wave briefly. They seemed to enjoy our tiny audience. Everyone else was walking by not even looking out to see them. The waves were that insignificant, but the show they put on was like a mini pipeline. Although my movies don’t show it, they often rode further on the waves after doing a spin on the crest. They really pumped the waves, didn’t they?! 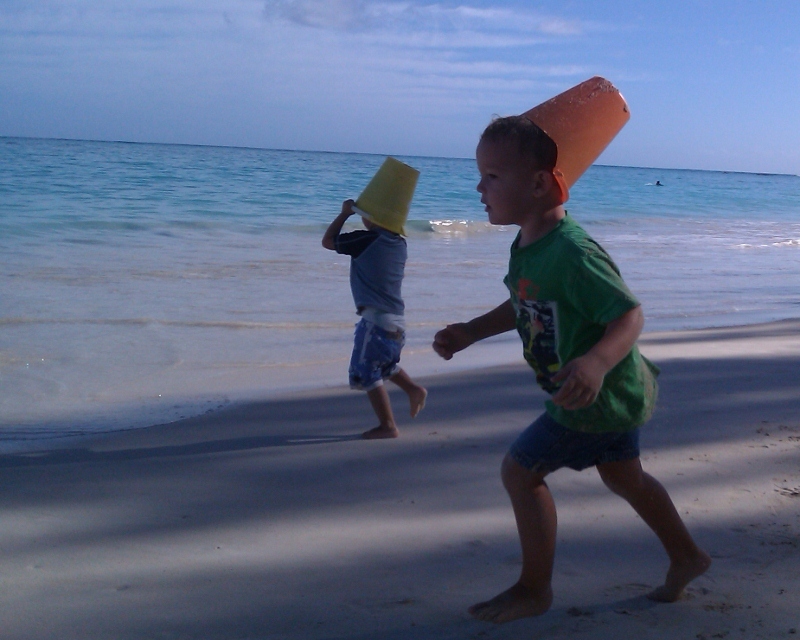 Ben and Ryder reunited for "bucket heads!" The last three days have been a series of daily disasters – but I didn’t realize the humor until this morning when the third disaster struck. Then it became funny. It all started with a blue plastic bottle at the commissary. Sam thought it looked pretty interesting. He’d been badgering me throughout the store about paper plates, yogurt covered raisins, more applesauce… So I told him, as I often do, if you can read it we can buy it. So I sent him back to the Kefir bottle. He brought back a blueberry probiotic smoothie. Since he’d read it, we bought it. This morning in our school morning madness, he wanted the smoothie. So he got it out and after I’d prepped cereal for the boys I went to shake it up for him and pour it. All of a sudden there was smoothie coming out everywhere – landing on Sam’s hair, his shirt, the floor. All over! In shock (because I hadn’t had any coffee yet!) I chose to laugh instead of get irritated. Then Dave chimed in from the couch where he was putting his shoes on – “I really think you should get control of yourself. It’s not funny.” Awww. But laughing was better than the alternative, which is sheer frustration at having to now clean up smoothie mess, change clothes all on top of an already busy morning. I thought it was a little funny seeing smoothie come flying out and land all over Sam – probiotic, too, like what was going to grow in his hair? Is it like megafertilizer? It all turned out ok after Sam changed his shirt and we moved on with the morning. I found out later today my kitchen clock was 11 minutes slow. 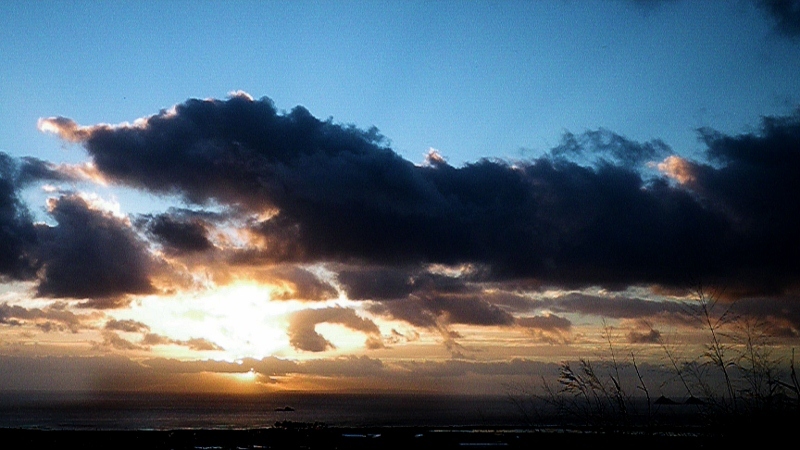 So hopefully tomorrow when I get 11 minutes back in my morning all will come together smoothly…here’s hoping! Happy New Year, family and friends! We mustered up some energy to hit the beach on a beautiful day. Obama was on base so we had to turn around and head to Kalama, but in so doing were able to hook up with Tita Bear and Tito Pig!